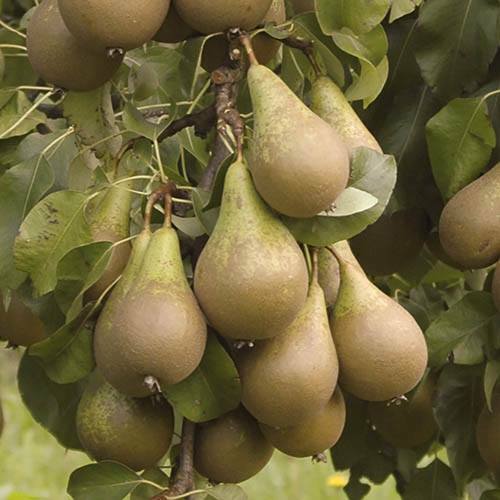 Britain's best-loved and most recognised Pear fruit tree variety, well suited to growing here. Supplied as a bare root dormant tree 1.3-1.5M tall, to plant straight out Nov - May. 'Conference' Pear produces a large crop of fruits with clear white flesh that are ready to pick each September. The long, tapering fruits are packed with an irresistible sweetness and lip-smacking juice that will drip from your chin when you bite in to a ripe one! Because of its outstanding flavour, it remains the most popular pear grown in Britain by a long measure both in commercial orchards and home gardens. It is perfect for you to grow because it is very heavy cropping and when picked unripe, it is great for keeping for 2 or more months. 'Conference' is largely 'self fertile' and will be supplied on Quince rootstock.